BoE Broadbent Speech will be released at the end of today’s trading session. While the US president is against the soft Brexit plan, the US will publish Existing Home Sales. The support rests at 1.31100 with resistance at 1.31680 which the weekly pivot point at 1.32340 is located in between the lines. The EMA of 10 is moving with bullish bias in the ascendant channel and it is below the EMA of 200 and the EMA of 100. The RSI is falling towards the 50 level, the Stochastic is moving in high ranges and MACD line is above the signal line in the positive territory. The ADX is showing strong buy signal. 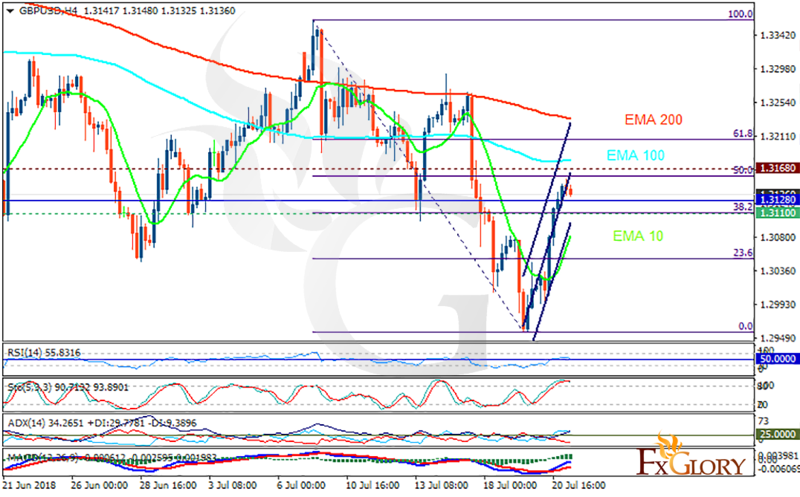 GBPUSD may grow towards the 61.8 level of Fibonacci at 1.32.